As they look to continue their revolution of the boot market, adidas has released a fresh 2016 edition of their signature knit upper boot with Ace16.1 Primeknit. 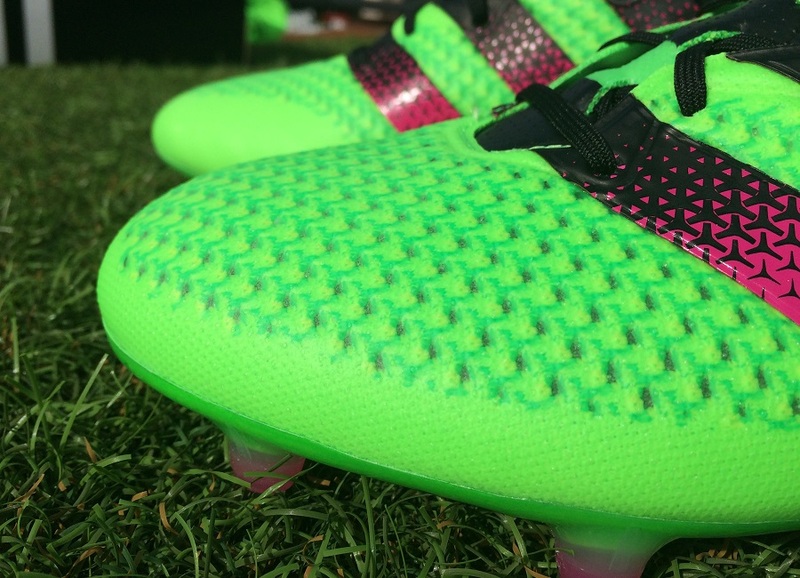 This time around, the Primeknit material covers the whole upper of the boot for total 360 degree control allowing players to “boss everyone”. A higher Primecut collar matched with a visually prominent Solar Green colorway also ensures that this is a boot with an unmistakable appearance. 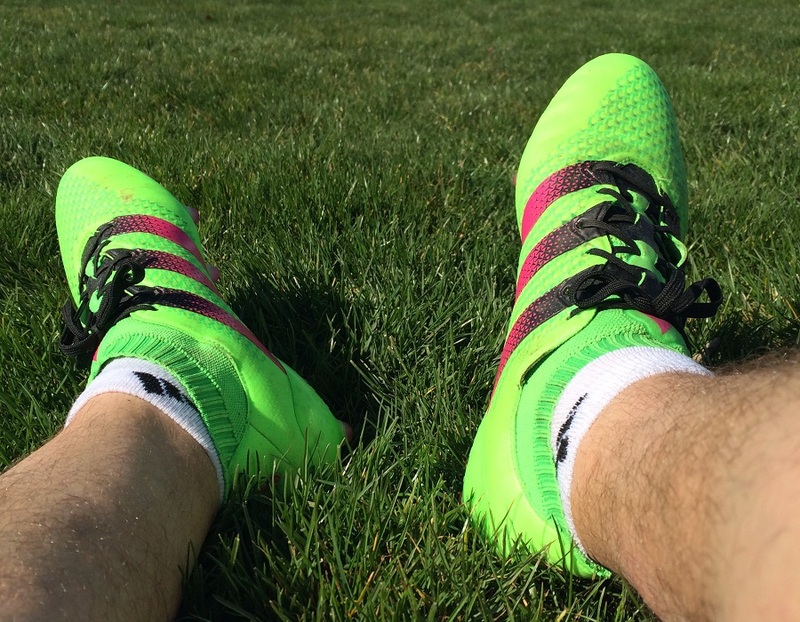 Now, you might be wondering why these look so similar to the laceless Ace16+ PURECONTROL released a few months back. adidas contemplated the notion that some players just might be ready to play without laces, so they continued with their tried and trusted Ace Primeknit series. Except, of course, these feature one significant difference in appearance! So, what exactly does this latest version of Ace Primeknit have on offer, and how do they compare to their predecessor? We’ve had them in testing for several weeks and the results are pretty conclusive, as follows. Moving the range toward a higher cut collar line is a bold move, especially when you factor in the success of the 2015 model. 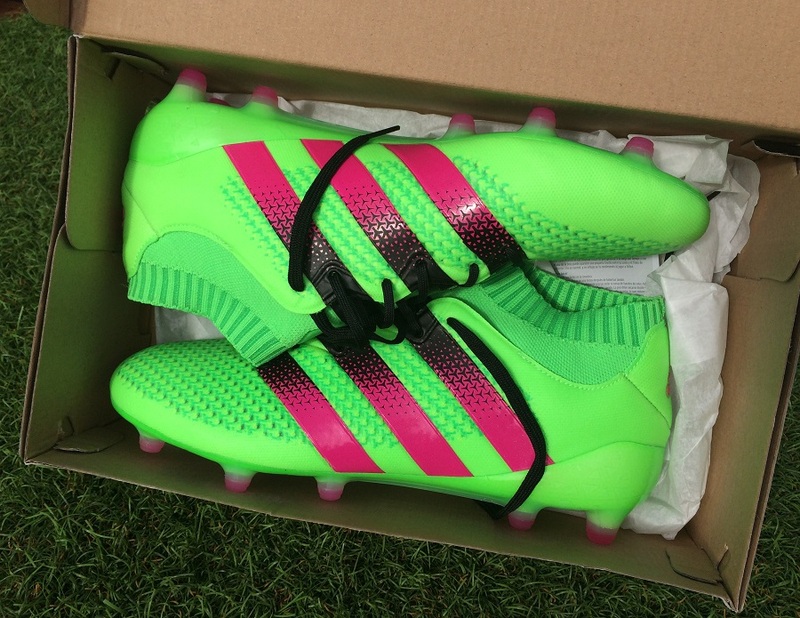 Visually, they definitely pop and provide a look that other players will want to see up close. The introduction of a full knit upper with laces also raises intrigue; how will that play out support wise through the heel region and will they be just as durable? When it comes to testing boots, one of the most annoying things is when you find yourself deep in a game not thinking about the boots. It basically means they’ve passed all the tests without allowing you to take notes through the process. Primeknit tends to have that effect. To put it more simply, this is one heck of a comfortable boot to wear! From the spacious fit through the forefoot, to the form-fitting snugness through the midfoot, everything about these is positioned around your feet in perfect harmony. Some folks have asked about the Primecut collar, and we will delve deeper into it below. Just note that it fits well around the ankle without any restrictive feel. Through wear, I didn’t encounter any hotspots, but I did feel a little looser than I would have anticipated without the laces tightened. Well no duh – just tie the laces then. Yep, that definitely solves the problem, as noted in how comfortable they were through a game. But, what I’m getting at here is that the upper material is not as constrictive as you will find on the PURECONTROL. 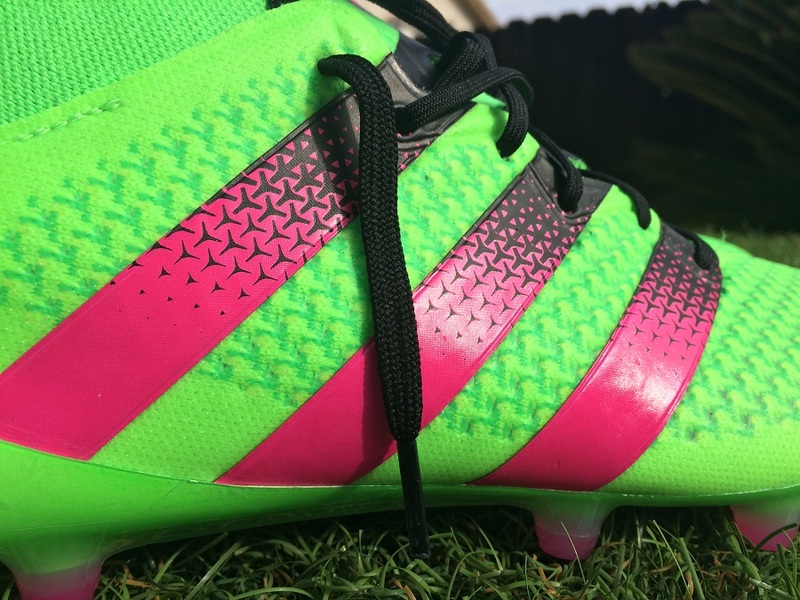 Both boots have a more hollowed out ankle cut to provide players with a more locked in fit. On this version, it seemed to create a little extra space toward the top of my foot as the material doesn’t have the need to be pressed up against your ankle. Ever so slight, but I could feel a difference in how they positioned over time as opposed to that pure locked-in fit you get from PURECONTROL. We’ve learned that adidas spent extensive time actually perfecting the height of the Primecut collar. It took a lot of testing and player feedback before they finalized on the design. When you put them on, the top line runs tightly just above the ball socket, giving the material an area to grip on and be held in. In a standing motion, the material hugs right around without any separation, but as you move your ankle, there is some give around the heel. So, it fits snug but not restrictively tight. If you look inside the boot, it looks like the Primecut collar runs right into the material used through the forefoot, and this is the case. The material is all one, ensuring it moves more in unison with your entire foot. What is its role through play? Unlike Nike’s line-up, there is nothing in the adidas advertising campaign that claims these as an extension of your leg. Instead, it is all about providing a secure fit through wear. Even if the material doesn’t add any valuable support (in cases where you twist and turn your ankle) you can feel its presence and that, for some, might be beneficial from a mental perspective. Some might enjoy the feel and gain some confidence from having extra security thanks to its snug fit. Will it eventually get too loose? Off foot, the opening seems to be wider visually, but I can’t say I’ve noticed any difference during play. To date, I’ve worn them maybe 20 times, so that is a pretty extensive period of testing and enough to say players won’t encounter a negative experience with the collar. 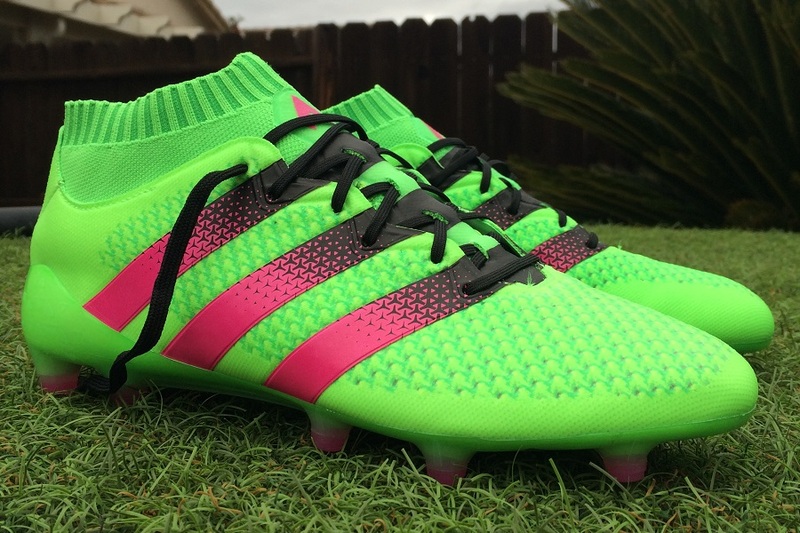 For the first time, adidas has chosen to use Primeknit through the entire upper. You can break the structure of the boot up into three different layers. Inside the boot, there is an internal cage system, that helps hold your foot locked in through the midfoot. 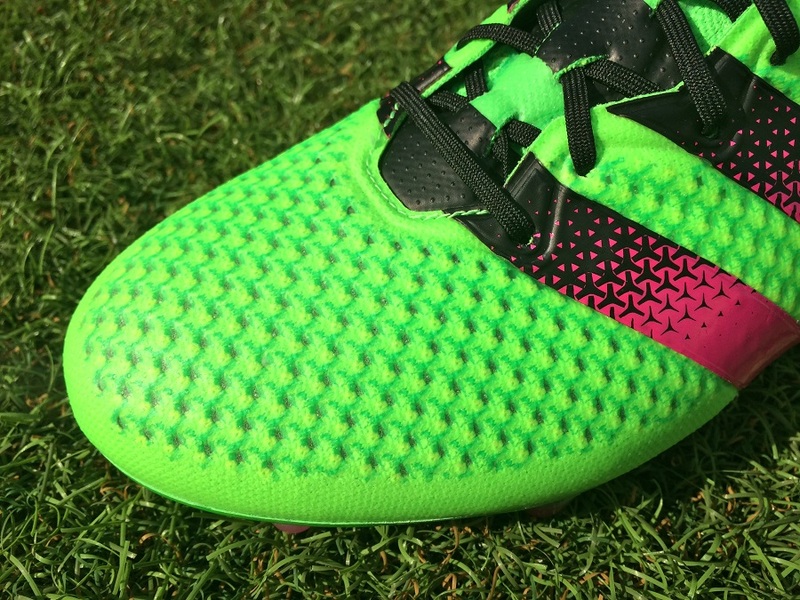 Above that is the primary layer of Purecontrol that covers the entire upper. The the all important silicon coating that holds the upper together and helps protect the softer knit material from the elements. Each layer plays its own role, and as a whole it comes together nicely. There are several key things you can note about the upper. First, the material is surprisingly pliable to the touch, something that only gets better the more you wear them. Being that it is pliable, you also won’t be surprised to hear the nature of the material gives you great feel as you look to dribble with the ball at your feet. The forefoot also feature plenty of definition, created by how the silicone material is “melted” on to and contours the Primeknit. That seems like the best way to describe it, and it aids in touch and control by providing a little extra surface space to connect with the ball. When it comes to shooting, you can get some serious pop without feeling the full impact. Knit material is softer, so you get the benefit of more shock absorption. We did a little test with rapid fire shooting, 10 balls in 10 seconds just to see how it would feel. Right through the 10th ball, I felt confident striking through without negative results. 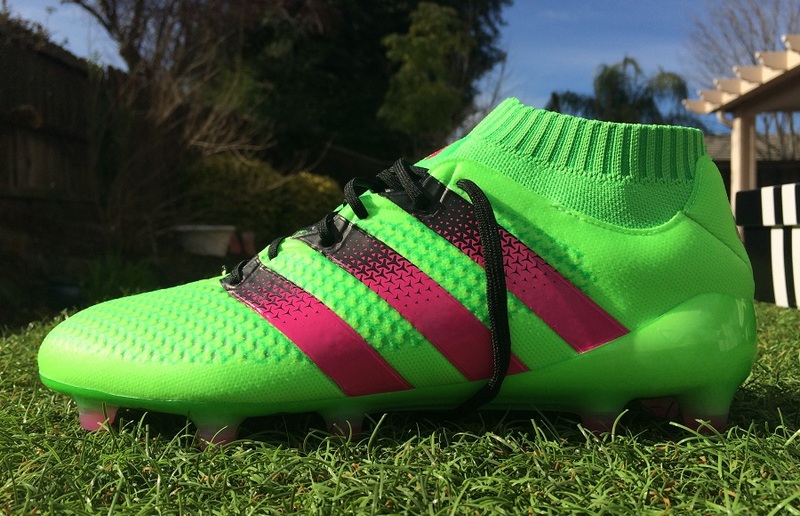 The first thing is obviously laces – either you want them or you don’t. 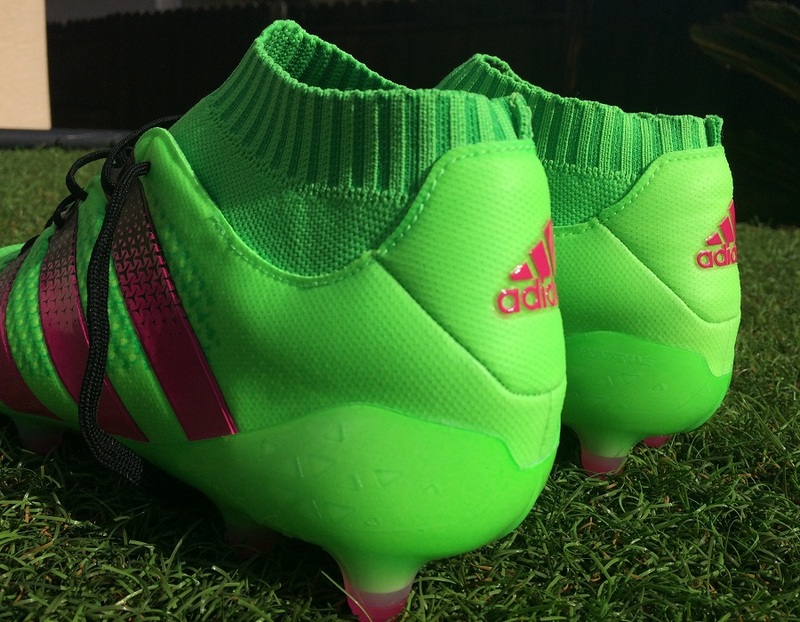 In order to make a boot with no laces functional, adidas has had to tighten up the walls of PURECONTROL and made them a very secure fitting boot. Primeknit is not so different, but the big difference is obviously the fact that you have laces to tighten to your own specifications. Through the forefoot, both look very similar. But they feature a very different type of composition. Because PURECONTROL is all about that laceless for and design, the upper is actually more rigid and the silicon coating across the upper feels a lot more like a layer of synthetic. On Primeknit it is far softer and more like a micro thin layer than it is intended to provide a waterproof coating rather than support. Underfoot, both boots are the very same. So it comes down to this – no laces means a naturally tighter fitting boot from first wear and a high tech visual appearance; laces means a slightly looser fit with the ability to tighten them yourself. Check our PURECONTROL review if you want some more insight on how they perform. Everything here is just the same as it is with PURECONTROL, with a more tech visual effect placed on this version. Adidas has returned to a SprintFrame, and that is probably one of the more surprising aspects of this release! You might remember the SprintFrame as being the soleplate of choice for the adiZero series. The difference on this version is a switch to conical studs, something that allows adidas to continue referencing to them as an AG option. This they have labelled as GroundCTRL 2.0. Yes, these boots are again labeled for use on both FG/AG. You might recall the Ace15.1 featured a soleplate with multiple nubs through the main conical studs, improving overall grip and traction on the surface. Why adidas has took this new route is an unknown, but our guess is that it decreased the overall weight of the boot, something adidas was obviously focused on achieving. From a performance perspective, they work out really well. On both AG and FG they provide valid traction without any over grip on the surface. From wearing them on AG, I’d recommend them as an option for players who are balanced and want something to help them accelerate out of tight spots. When you are comparing both side by side, the first thing that jumps out is the higher cut, “Primecut” ankle collar on the 16.1. Unlike the collar seen on current Nike releases, Primecut is there to provide a secure fit around the ankle rather than create an “as-one” feel between leg and foot. It is a lot simpler in design. If you want something a little tighter around the ankle, then the newer version are a better option. But from a personal standpoint, I don’t see the necessity for a collar and I was really mesmerized by the performance of Ace 15.1. So much so that they are still a top go-to option from my bag. If you can find the original at a better price, they’d be my top recommendation. If you range from a mid to wide fit, they will work for you. The upper is naturally a little wider fitting with the walls providing some light stretch thanks to the Primeknit material. But don’t be fooled here; the silicone overlay is intended to hold the material in check, thus they really won’t stretch much over time. Thankfully, they are spacious through the forefoot and that will allow wider fitting players the opportunity to wear them comfortably. For those with a medium fit, the Primecut collar and internal cage system will help lock your foot into the boot. If you are looking to secure a pair, choose true to size. They fit very much in check with standard adidas releases and are comparable to the Primeknit 15.1. We covered a lot of fit questions in a recent Primeknit Q&A. If you have a few minutes, make sure to check that out for more details. An issue I’ve run into in recent times with higher cut collars is the fact they don’t air out as well as a regular cut, and as a result they can pick up some nasty scents quickly. Well. while testing these out the weather was a little wetter than normal, and drying times were obviously impacted. As a result, they began to really smell funky quickly. There is HUGE importance with these (and other mid cut collars) to get them out of your bag and into a proper drying area as soon as possible. That is also the case for any regular ankle cut boot, but because of the closed collar, you really need to be time sensitive. From a performance perspective, there is nothing else of concern. I’m personally not a fan of the price-point, but it seems to becoming a norm for boots that fall into the top-tier category. There have been several colorways released to date, check out the full line-up available at soccer.com. 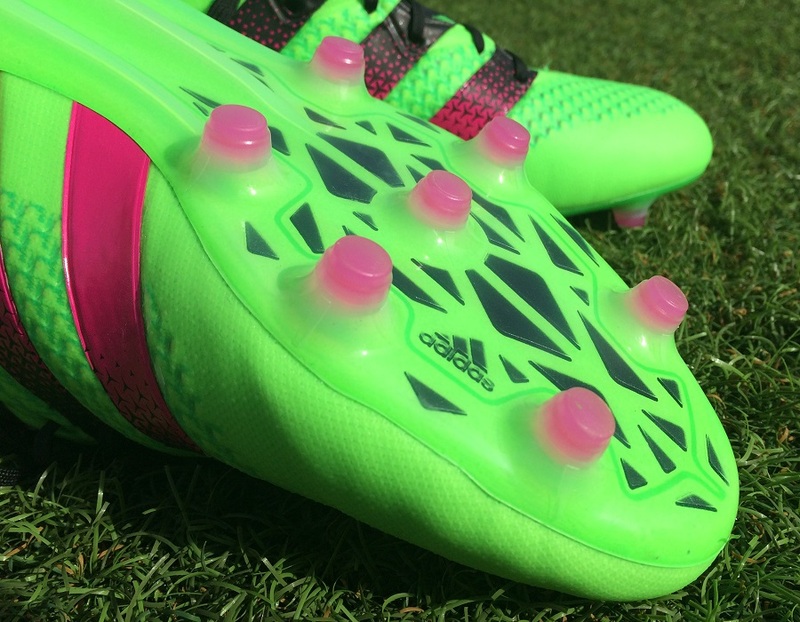 Highlight: A technically advanced control boot from adidas that takes Primeknit in a new direction. 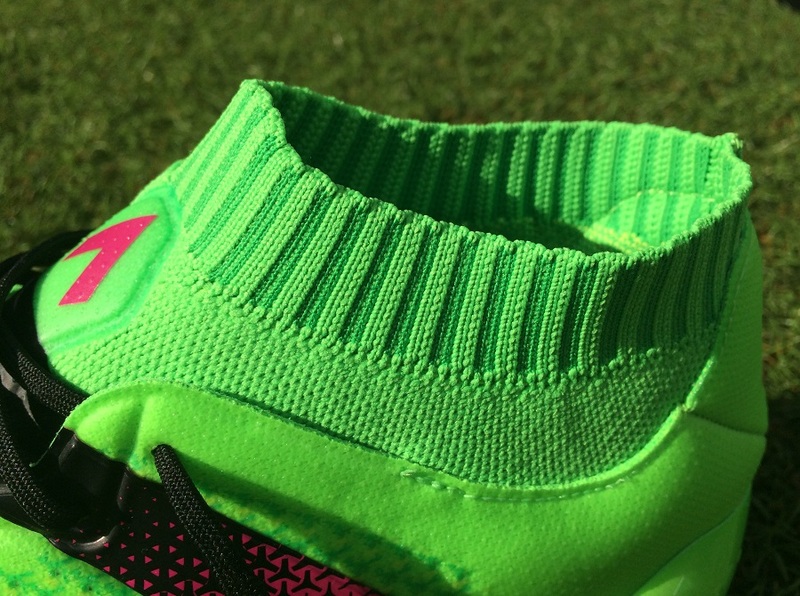 Primecut collar provides a more locked down fit than regular cut boots. Category: Control all the way! Weight: 7.8oz, which is a very solid weight for a control boot. Would I Buy Them: I like these a lot and they’d be a top recommended option. So yes, unless you offer me a pair of Primeknit 15.1 instead. Player Position: There is a universal feel about these boots, that allows them to fit a wide variety of playing positions. I don’t see them as the ideal choice for speed players that value all out acceleration, but outside of that they are a great option.